The raven is huge compared to other corvids. Note the 'fingers' on the wings, the diamond-shaped tail and the long and heavy beak. "Two ravens sit on Odin’s shoulders and whisper all the news which they see and hear into his ear; they are called Huginn and Muninn. He sends them out in the morning to fly around the whole world, and by breakfast they are back again. Thus, he finds out many new things and this is why he is called ‘raven-god’." – Snorri Sturluson 13th Century Icelandic historian. RAVENS are back in Kent. Specifically, they are back at Chartwell and Mariners Hill, and their signature cronking call can sometimes be heard above the chack of jackdaws and the yaffling of green woodpeckers. It has been a remarkable comeback. Ravens were heavily persecuted in Britain; pushed literally to the brink with poisoned carrion, forced back onto the sea cliffs of Wales and into the far North. Eight years ago, camera man Richard Taylor-Jones filmed the first breeding pair to make it back to the white cliffs of Dover. 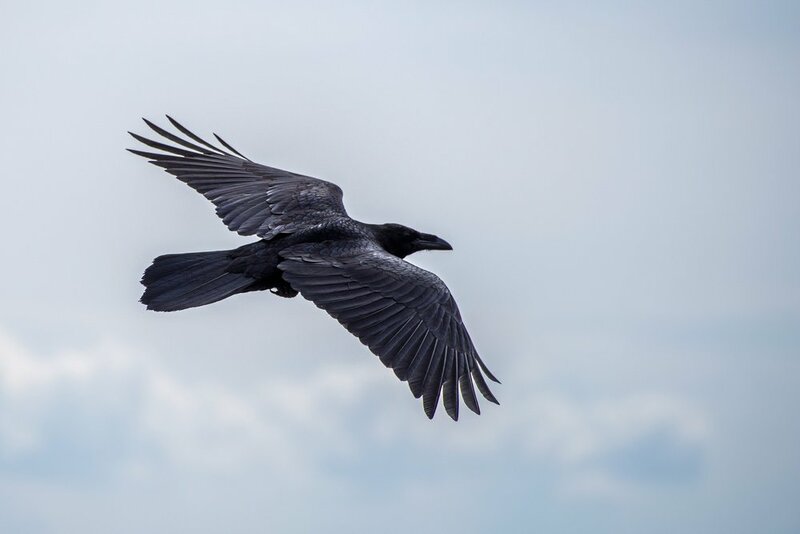 Now, ravens are routinely reported by birders in Kent and Sussex and there are an estimated 12,000 breeding pairs in the UK, with tens of thousands in Ireland. They are a protected species under the Wildlife and Countryside Act 1981. The latin name is Corvus corax, and these are fantastically bright birds - displaying an intelligence only matched by apes and dolphins. They can solve quite complex puzzles. They are big birds too, with a wingspan of around 150 cm (or five feet for those of you who still do Imperial) and while they will eat most things, they're designed for carrion: if you ever got close enough you'd see the meat-tearing hook on the upper bill. They're not that fussy about what kind of carrion either, and their habit of feasting on battlefield casualties and the corpses of hanged men and women has driven dark superstition across Europe. In Swedish folklore, they were seen as the ghosts of murdered people who did not have Christian burials; in Germany, they were damned souls. On the Pacific North West, though, the Canadian first nation people known as Haida see the raven both as a creator, and as a trickster (not unlike Loki in Norse legend). In Haida mythology, the bored raven found some creatures hiding in a cockle shell. The timid creatures were coaxed out by the intelligent and persuasive raven, and became the first men. But the raven soon tired of them, and was thinking of putting them back in the shell when he had an idea, and went looking for the female versions. He found the ladies in a mollusc called a chiton, and then had lots of fun watching the males and females ... er ... getting to know each other. The Museum of Anthropology at the University of British Columbia in Vancouver has a remarkable sculpture of the Haida creation myth by Bill Reid - it's a huge wood carving, about the size of small car, showing Raven releasing man from the cockle shell. In Haida mythology, the Raven stole the sun from his grandfather Nasshahkeeyahlh and made the moon and the stars with it. He filled the streams with fresh water and scattered the eggs of salmon and trout and placed animals in the forest. The raven created lakes, rivers and filled the land with trees. He separated night and day. He wasn't always nice, but he was always a hero. Ravens are also present in Norse mythology. As the excerpt above reveals, Odin - the AllFather - kept two ravens, which he sent out into Midgard as spies. Long before the vikings were a force to be reckoned with, images of Odin (he has around 140 names, actually) were shown with ravens. These big, bright birds have around 50 different vocalisations, and - like other corvids - can be taught to talk. This one was taught to say "Nevermore ..." (click on the word) an illusion to Edgar Allen Poe's gothic poem The Raven. They are acrobatic, strong fliers - and they have a sense of fun. Tap 'ravens sliding' into YouTube, and have a little fun yourself.